We are now at the end of Unit 2. This page outlines two ways of reviewing what you have learned, whether you are doing the module as part of a degree or using it to study informally. to explain the method of making use of CST referred to as ‘see, judge, act’ and the ‘pastoral spiral’ [2.3]. It is possible that, when you first re-read those points, you’ll think you can’t easily do those things. But as you look again at some of the material, you might be surprised. When you re-read specific pages, do you find that you largely know about what you encounter, even if you couldn’t easily bring it to mind beforehand? Or is the material really unfamiliar? If it is the latter, you might want to read through some of it again. How you can best discuss with others what you have studied for this unit will depend on the university or other context you are in. If you are studying formally, you may be expected to participate in a seminar on what you have read for Unit 2. The format of this will be determined by the Module Convenor in your university/college. Possibly one student will be asked to prepare a discussion paper. If you are reading the material alone, so cannot have a face-to-face discussion of it, you are welcome to post your reactions to it and any questions at Comments on Unit 2. These will provoke a range of questions. Focus on those that really are to do with this unit – rather than others that might be highly interesting but are not relevant at this point. You might also like to look again at the discussion questions proposed half way through unit: 2.2.6. 1. From what you learned about economic liberalism and socialism in the historical outline (2.1), discuss whether each of the above principles is consistent with or contradictory to those two ideologies. 2. 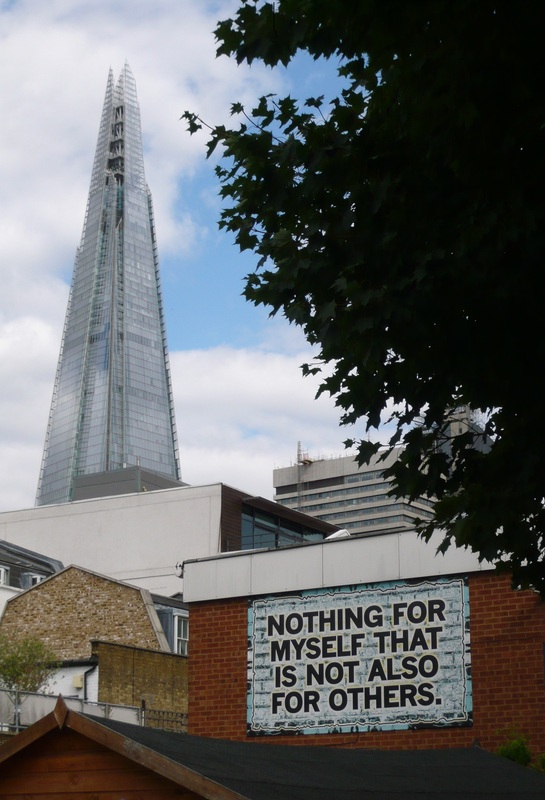 It is clear that CST’s position is distinct both from economic liberalism and from socialism – but is it closer to one than to the other, or equidistant from both? 3. Take any one of the above principles and think of it as a criterion or standard (in line with what 2.2.9 said about the meaning of ‘principle’). Try to identify one practical thing in human social life (for example, in the workplace) that the principle positively requires – i.e. that meets the standard it sets. Then identify one practical thing that breaks the principle – i.e. that falls short of that standard. This may not be an easy, but it is very much worth beginning to think about. Do the same with a second principle, and, if you have time, a third. 4. To what extent does the slogan in the banner pictured on the right express what ‘the common good’ means? 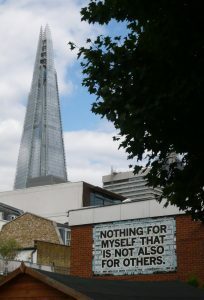 The banner is a work by artist Mark Titchner on a building at the shared site of two schools, Cathedral School (Church of England) and St Joseph’s School (Catholic), in Southwark, London. (a) the church’s response in Rerum Novarum to the crisis of workers’ conditions? In seeking to integrate taking action with study of CST, what are the strengths and weaknesses of the ‘see, judge, act’ method and ‘pastoral spiral’? In particular what pitfalls can ‘see, judge, act’ and the pastoral spiral help people to avoid? You might wish to post some points from your discussion of these or other questions in Comments on Unit 2. You are now at the end of Unit 2. You might wish to review the Module A Outline or go to Unit 3 Contents.